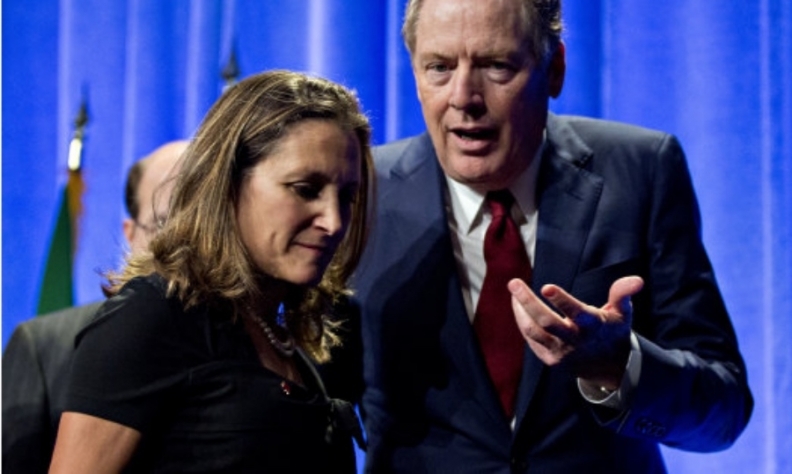 Robert Lighthizer, U.S. trade representative, speaks to Chrystia Freeland, minister of foreign affairs, have agreed NAFTA talks need to continue. The federal Liberal government insists it has a plan to combat U.S. auto tariffs should its neighbour deem auto imports a national security threat and subject them to a 25 per cent tariff. Foreign Affairs Minister Chrystria Freeland just isn’t saying what the plan is. The Standing Committee on International Trade grilled Freeland Tuesday, with several members demanding to know what, if anything, the government has planned to offset tariffs U.S. President Donald Trump wants slapped on automotive imports. On May 23, the U.S. Department of Commerce started an investigation into auto imports to determine whether they "threaten to impair the national security,” a move that could lead to 25-per- cent tariffs on assembled vehicles shipped to the United States from Canada. Just this week, TD Economics said such a move would kill up to one in five manufacturing jobs in Ontario alone. Conservative MPs Randy Hobak (Prince Albert, Sask.) and Colin Carrie (Oshawa, Ont.) said they were “worried” about Trump’s threat, noting his administration eventually followed through on steel and aluminum tariffs under the claim of protecting U.S. national security. A 25-per-cent tariff on steel imports and a 10-per-cent tariff on aluminum products went into force June 1. Freeland didn’t directly answer Carrie’s question. Instead, she sang the praises of Canada’s auto sector. Toward the end of the committee meeting, Hobak demanded to know the government’s plan of attack. “I’m not going to reveal the details today,” Freeland replied. But, she assured the committee a plan is coming together, just as it is for the country’s steel and aluminum sectors. “It is absolutely the case that our steel and aluminum…industries need our support,” Freeland said. Finance Minister Bill Morneau and Industry Minister NavDeep Bains are “working on ways” to support those industries. who will be impacted by the tariffs. The motion passed 4-0.